"I just wanted to write and thank you for such a great afternoon. 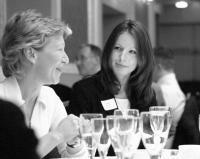 Every lunch I come to I have a great time, meet new people and always come away with useful contacts and future leads. Today's raffle donation was ?140 which is fantastic and takes your total raised this year to ?515 as well as kindly allowing me to attend the lunches so I really appreciate your support. We will write a formal thank you but wanted to send this in the mean time while I'm fresh from 'Boom Whacking'!" "The Business Network Chester is like a really good casserole. Lots of ingredients, all left to slowly cook and intermingle over a long period of time and as we all know a good casserole is always worth waiting for, and gets better and better, the longer and more slowly it is cooked. So if you are a Fast food kind of person then we are probably not right for you. " "Great Bear Distribution have been members of The Business Network Forum for almost 12 months and in that time I have met many interesting Owner Directors and Senior Managers of business. The Chester Business Forum meets monthly for a couple of hours at various prestigous Chester Hotels. Not only is there an opportunity to network with key decision makers in the region, it is also possible to present your organisation to a wider audience, on a one to one and if the opportunity allows as a formal seminar. My Company will in time I am sure be doing business with one or two of the key people we have met - this is a gradual process of confidence building ,and sharing of ideas and experiences. Equally many of the smaller companies and individuals can provide a higher degree of personalised service, something which has been lost and perhaps missed in a quest for business growth. I highly recommend any business to put a toe in the water and meet two highly motivated organisers and many like minded business networkers at a future meeting.... Go on try it - nothing ventured nothing gained.! " "Congratulations on running a really relaxed feeling event. I met some lovely people some of whom already I hope to do Business with." "I have been a member of The Business Network Chester from the start and always come away from the seminars and lunches with great new connections, leads and a feeling that I am getting to know the business community in Chester more and more with every visit. At Clatterbridge Cancer Research our approach is very much long term and that suits the ethos of BNC, it?s not about hard sell and more about long term relationships and building up connections. This year Tracy has gone above and beyond and took part in our major fundraising event Come Dancing, as you would expect she gave it 110% and is our reigning champion! Huge thank you to Tracy and Hayley for really making us welcome every month and bringing a real benefit to the team at CCR"